Leaders in New York State's Aging Network postponed their three-day-long meeting in Saratoga Springs because disasters tend to have the greatest impact on the people they represent -- older New Yorkers. Oct. 29, 2012 - PRLog -- On Monday, Nancy Dingee, Director of Schoharie County Office for the Aging, was preparing for Hurricane Sandy rather than getting ready to attend the NYS Association of Area Agencies on Aging’s Leadership Institute conference, which was scheduled for Tuesday through Thursday in upstate New York. Leaders in New York State's Aging Network (the Directors of the 59-plus Area Agencies on Aging within the state) postponed their three-day-long annual meeting in Saratoga Springs because disasters tend to have the greatest impact on the people they represent -- older New Yorkers. "We have a lot to discuss at our annual meeting -- the impact of Medicaid Redesign on the Aging Network, the impending reauthorization of the Older Americans Act at the Federal level, the threat of sequestration on the community-based programs that help older New Yorkers remain independent and living in their homes -- but Hurricane Sandy is just the kind of event that keeps office for aging Directors at home because disasters have a way of hitting the most vulnerable populations the hardest," said Laura Cameron, Executive Director of the New York State Association of Area Agencies on Aging. That was definitely true for Hurricane Irene and Tropical Storm Lee. Case management and disaster relief continue to be priorities for the Schoharie County Office for the Aging, according to Nancy Dingee, Director of the Schoharie Office for the Aging. Dingee was one year on the job when Hurricane Irene and Tropical Storm Lee caused about $73 million worth of damage in Schoharie County. Luckily, the office had recently moved to a web-based database when the flood hit, allowing Dingee and a colleague to access it from their homes. Even before they were allowed to come back to work, they were on the phone and on the database identifying seniors who were vulnerable to the flood and trying to determine their location and well-being. Last time, initial contact with the seniors was made through the Schoharie County Office for the Aging's home-delivered meals list. Schoharie County has been very supportive of that program so it’s a comprehensive list of the frailest seniors in the county. Dozens of homes were washed away and thousands impacted by the flood. To this day many of the seniors are living with family which is stressful, Dingee said. Dingee, Director of the Schoharie County Office for the Aging is available for interviews. Her cell is (518) 875-6834. Her office number is (518) 295-2001. Laura Cameron, Executive Director of the NYS Association of Area Agencies on Aging is also available. Her cell is (518) 424-2556. She cancelled the conference Dingee and her colleagues were supposed to attend this week when Gov. Cuomo declared a State of Emergency. “We represent the 59 offices for the aging around the state, but those people need to be on the ground in their communities preparing for Hurricane Sandy so we’re rescheduling,” Cameron said, when she announced they would postpone the event. "The Gideon Putnam Hotel, where we were supposed to meet, has been very understanding of the situation," Cameron said. "They're of course also on high alert. Right now we just want everyone to be safe. Hopefully, we'll be able to reconvene after Thanksgiving." For more information contact Sheila Carmody (518) 366-6148. The New York State Association of Area Agencies on Aging represents New York's 59 county-based Area Agencies on Aging (AAAs) and works collaboratively with a network of organizations that exist to promote independence, preserve dignity and provide support for residents of New York State as they age. 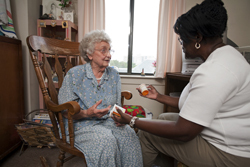 The Area Agencies on Aging (AAAs) were established under the Older Americans Act of 1965 to respond to the needs of Americans age 60 and over. They do it by being the "go-to" for home and community-based services -- nutrition counseling, adult day services, home energy assistance, home delivered meals, among other things -- that make it possible for aging Americans to live independently and with dignity in their homes and communities for as long as possible. Services provided through the New York State Area Agencies on Aging (or Offices for Aging) are funded through the Federal Older Americans Act, New York State, county government, contributions from participants and other sources. Expanding and extending the Area Agencies on Aging reach and resources is an option for dealing with the high cost of long-term care for New Yorkers. The community-based services they provide allow the oldest members of our communities to live independently for longer -- and delay Medicaid eligibility.